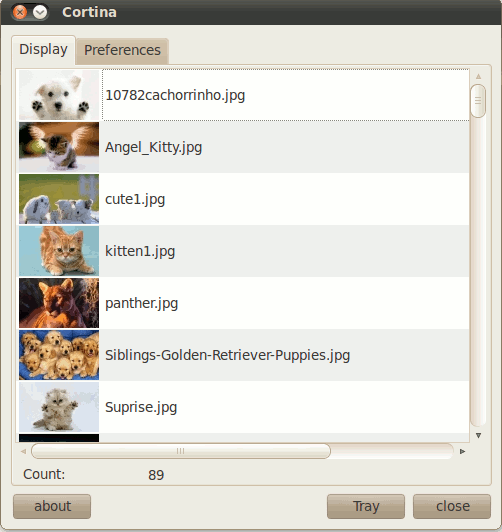 Few years back, I always lamented that there are few and little wallpaper changer apps for Ubuntu desktop. Fast forward to today, this is no longer the case. 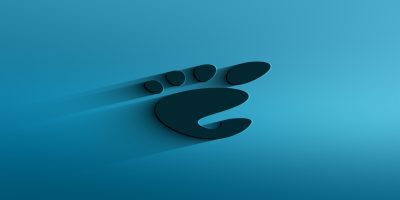 There is the evergreen Desktop Drapes that has been around since the early days, the still useful Wallpapoz that has stopped development and the cross-platforms compatible Wally that can grab your wallpapers from Flickr. Well, it seems that there is another new kid in the block: Cortina. 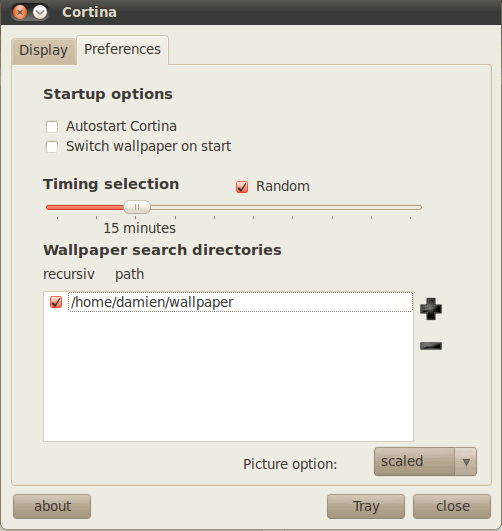 Cortina is a simple wallpaper changer for the Gnome desktop. It does not come with any fanciful features that other wallpaper changing app don’t have, except that it is pretty lightweight and perform all its task quickly and swiftly. For other distros or other versions of Ubuntu, you can download the deb, or tar file in the download page. The first time you run Cortina (Applications -> Graphics -> Cortina), it will prompt you to select the folder where you contain all your wallpapers. Once you have selected your wallpaper folder, you will see an icon appearing at the system tray. Right click at the Cortina icon to bring up the option page. You will see two tabs: Display and Preferences. The Display tab is where you can see your collection of wallpapers waiting to be rotated in the desktop. 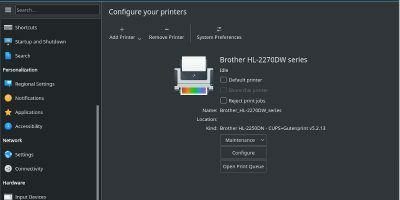 The Preferences is where you can configure the wallpaper and application settings. You can configure Cortina to Auto start when login and to switch wallpaper on start. There is also the lapsed time before every switching of wallpapers. Lastly, there is also the wallpaper search directories where you can add/remove folders of wallpaper images. At the bottom of the preferences pane lies two confusing buttons: Tray and Close. Most people will tend to think that the Close button is to exit the Options page, not quitting the application. This is the confusing part: the Close button actually closes the Option page as well as quitting the app. If you just want to close the Options page (without quitting the app), you will have to press the Tray button. Seriously, I don’t see the need to have both the Tray and Close button. It’s kinda confusing and misleading. (To the developers) Having the Close button to close the Option page will do. Update: The latest version of Cortina has fixed this issue. There is only one Close button now instead of two confusing buttons. Thanks to Eric for listening. Cortina is not a very impressive wallpaper changer. Nor does it comes with any killer features that make it a must-have app. However, if you are looking for a lightweight application that can get the work done with speed and no hiccup, then Cortina is a good one. Nice software. I really like it. Thanks. I like Wallpaper Tray. 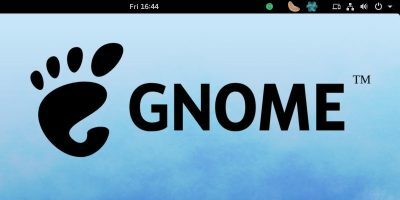 Does pretty much the same thing, but as a GNOME panel applet. It's already in the default repositories, so just “sudo apt-get install wallpaper-tray”. Then right-click a GNOME panel, select “Add to Panel…”, pick “Wallpaper Tray”, and click “Add”. Right-click and go to Preferences to set wallpaper directories and other options. 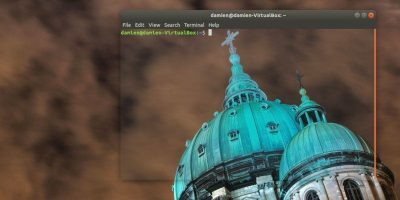 Even though I think that we shouldn't compare Gnome to KDE since they are of totally different architecture, I do agree with you that the wallpaper changing ability should be part of the core functionality. 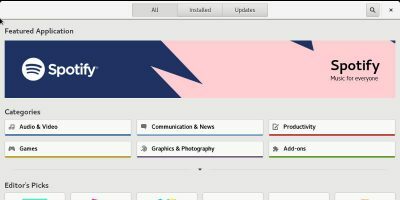 I have been looking for such inbuilt functionality since the days I started using Linux, and until now it is still not available in Gnome. To use a cron job is not for everybody.. someone like to use a gui what sometimes makes things easier and faster. Yes, I agree. Using cron job maybe a quicker and faster solution, but it is definitely not for anyone, especially the newbies. Thanks to Eric for such an useful lightweight application. popup Cortina window. But it die automatically. Restart it. It starts as an icon on top tools bar. Right-click the icon starts Cortina window. But it dies automatically. I already work on this issue. If you want to help fixing this issue go to the site i posted below. I released a new version that is more insensible as the older one. Should fix the issue you described. Today I’ll release Cortina 0.7.2, can you please update/rewrite your review?